We spent an entire month in Curacao this year, arriving on November 5, on a flight from Savannah via Miami to Curacao, and departing on TT2 for Bonaire on December 5, the longest commissioning time we had ever spent getting the boat ready. Why so long? Basically because projects required ordering “stuff” from the USA that took a couple of weeks to arrive in Curacao. What projects? Our 20-gallon water heater was leaking; it needed replacing. The generator had been running just a little warm of late; the usual suspects appeared to be innocent, so it was time to remove and check the heat exchanger. When I got it out, the chambers were clean! But alas, one of the ends was damaged (maybe by me, during the removal.) So we were forced to wait for the delivery of a new heat exchanger and a new water heater. So what caused the minor over-heating problem. Not sure. But replacing the heat exchanger had necessitated partially draining the coolant, so when the exchanger was finally installed, I completely drained the coolant, flushed the system, and replaced the coolant with fresh and new. That seemed to solve the problem. But all was not work. We had delightful dinners with Maggie & Al (Sweet Dreams) and Paulette & John (Seamantha). Heather & Don (Asseance) were in the Marina when we arrived; it was good to catch up with them. Barb and I walked up to Rodeo Bar & Grill for dinner many many times; their ribs are second only to the home-made perfections created by Bill (nee Dolce Vita). Perhaps the most interesting gastronomic experience was the Thanksgiving dinner we attended with Laura & Jason (Blue Blaze) and Sabrina & Tom (Honey Rider). Someone saw an advertisement of an American Style Thanksgiving dinner to be held at the Rif Fort in Otrobanda. Reservations were required; one seating only; 60 persons max at a long table family style; payment in person required in advance. We arrived early, and settled in for drinks on a balcony on the east side of the Fort overlooking the St. Anna Bay and the pontoon swing bridge; there we were treated to the sight of the full moon rising over the city. When we made our way to the dinner venue on the upper inner wall on the west side of the Fort, we were surprised to find the long table wasn’t so long and accommodated only 32. Our hostess explained that the dinner was conceived as a means to publicize the various eateries in the Fort and its immediate surroundings. Consequently, each separate establishment would be delivering samples of their fare, and our hosts would bring them out one at a time. Apparently, the quantities had never been adjusted from 60 to 32, for each serving was enormous. Apparently, there were MANY such establishments, because there were MANY servings, and they were eclectic! Here are some of the servings: a complementary serving of Prosecco, and then sushi, two types of pizza, mashed sweet potatoes, pork chops, grilled fish, green salad, small hamburger sliders, french fries, pumpkin soup, a small steak, and breads. (And I think I have forgotten some.) And then the finale: brussel sprouts, stuffing, and roasted turkeys, brought to the table whole and uncarved and as brown and as pretty as you please! We six Americans (the only non-locals in attendance) almost swooned! (Although that may have been because by that time we were all VERY full.) We had to ask for someone to come back and do some carving, an operation we watched with considerable amusement. We had been promised cranberry sauce and one of us asked about that. Apologies were given and then a triumphant and proud return with the strange garnish that those goofy Americans insist upon when they consume those strange birds. There soon followed puzzled looks on the faces of the six Americans. The “cranberries” each had a single hard sizable pit!. And the “sauce” bathing the berries tasted a good bit like cherry pie filling! Some among us opined that the berries were pomegranates, but I know better, having consumed gallons of pomegranate seeds when visiting my sister Zona, who likes pomegranate seeds A LOT. And they don’t have big pits. My guess as to the berry? Dunno. Dessert was apple pie served with heaping bowls of various flavors of ice cream. The launch of Tusen Takk II was mostly routine. Curacao Marine does a good job. But the launch ramp was slippery from an earlier rain, and so TWO tractors were used to ease the trailer into the brine. So we had a productive time in Curacao, but it is good to be in Bonaire. See our next post. This entry was posted in British Virgin Islands, Curacao and tagged Asseance, Blue Blaze, Curaçao Marine, Honey Rider, Otrobanda, PropSpeed, Punda, Rif Fort, Rodeo Restaurant, Seamantha, Sweet Dreams on January 13, 2019 by admin. This post will be a quick overview of some of our above-water activities during the last half of our season in Bonaire. Barb and I fell into the habit of having Sunday breakfasts at La Crêperie early in the season, and continued that practice throughout our time in Bonaire. When Mike and Roberta, co-owners of our pickup, arrived “late” in Bonaire, having been delayed by the birth of their first grandchild back in Portland, OR, they joined us in crepe worship. The four of us also partook of the best arepas in Bonaire at the gazebo on Coco Beach run by Yhanni. And we continued our practice of attending the Burger Nights at Zazu. We also went to Tuna Night at Hill Side; on one occasion transporting a gaggle of folks that overflowed into the back of our pickup. We also took the pickup to one of the monthly wine tasting events held at Antillean Wine. One afternoon we made sushi at Pat’s, whom we met a couple of years ago through Mike and Roberta. We went on a dive/snorkel trip to Klein Bonaire with Pat and Mike & Roberta and Rod & Jill and Rod’s cousin Chuck, afterwards stopping at the beach on the north side for a picnic lunch. Well before the arrival of Mike & Roberta, at the initiative of Lawrence (Phatt Cat), we began playing Mexican Train every Sunday night at the Divers’ Diner. It turned out to be a very popular event, attracting two tables totaling 12 to 16 players. Jill & Rod’s son Roddie visited for a while, during which a bunch of us celebrated Jill’s birthday at Zazu, including Kim and Doug (Gabriel). Speaking of whom, the couple again presented a series of four sessions on fish identification, this time hosted by Dive Friends at their Yellow Submarine location. The lessons are designed to provide certification with REEF to enable citizen-based fish surveys. On April 17 we joined Roberta & Mike at Pasta e Basta, a special occasion at the restaurant It Rains Fishes: an evening of dinner and music provided by singing waiters from an Amsterdam restaurant of the same name: Pasta e Basta. For a review of the Bonaire version, click here. We received word that my 99 year-old mother was experiencing health problems, so we pushed up our departure date from Bonaire and took Tusen Takk II to Curacao on April 23. We worked frantically at Curacao to put the boat to bed, including putting down four coats of varnish on the cap rails to help them resist the Caribbean sun during our six-month summer absence, but on April 28, on the eve of our departure, joined Al & Maggy (Sweet Dreams) for dinner at scenic Fort Nassau. This entry was posted in Bonaire, Curacao and tagged Antillean Wine, Burger Night at Zazu, Curaçao Marine, Fort Nassau, Gio's Gelateria, It Rains Fishes, La Crêperie, Yellow Submarine, Yhanni's arepas on May 6, 2018 by admin. On Monday, November 6, we flew out of Atlanta and on to Curacao via Miami. Bill met us at the airport; he was already there getting his boat Dolce Vita ready for sale. The boat was in Bristol condition and passed the subsequent survey with flying colors. But to no avail. At the last minute the prospective buyer got cold feet. The would-be buyer had absolutely no complaint about the price or the boat or Bill’s conduct; he simply realized rather late in the game that he didn’t want to be a blue-water sailor. 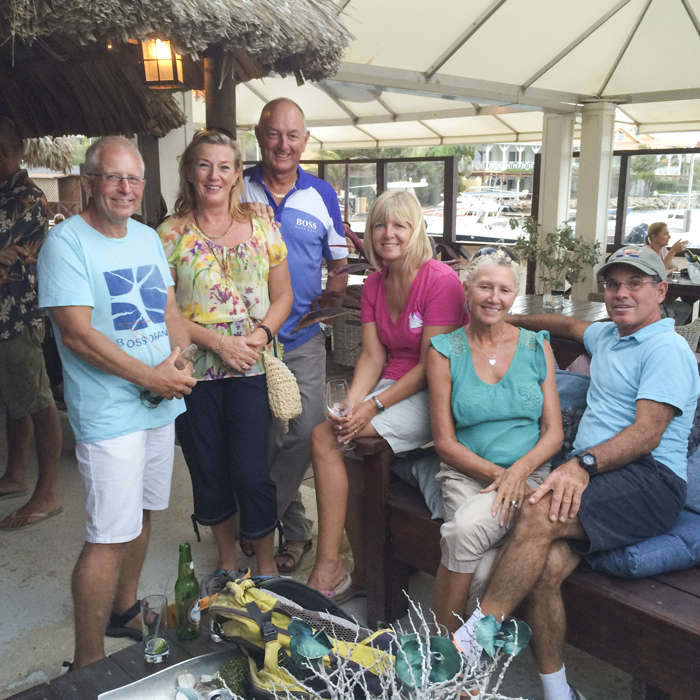 Bill subsequently took the boat up to the BVIs where he left it under the care of a broker in Trellis Bay. 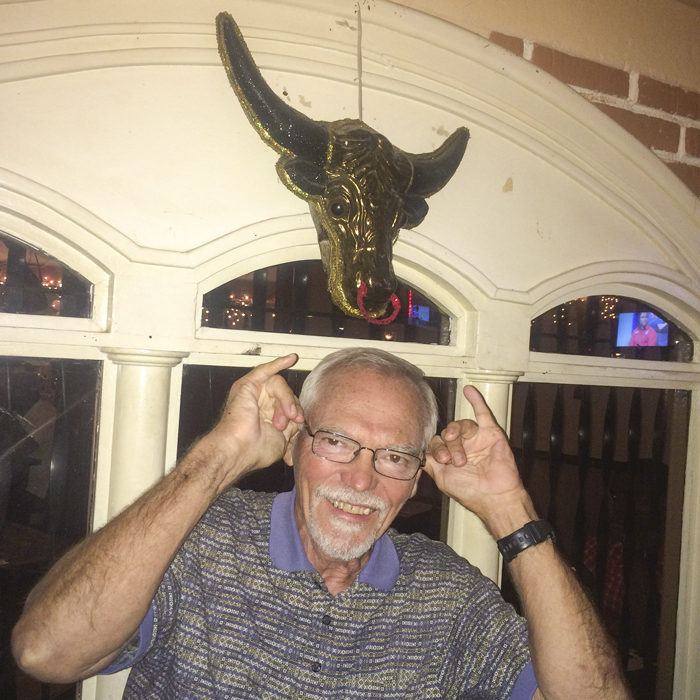 Our stay in Curacao was relatively brief and relatively busy, but we did have some pleasant outings with Bill before his departure, including some memorable orders of ribs at the nearby Rodeo Restaurant. We took delivery of our newly upholstered settee cushions (manufactured during our summer absence). 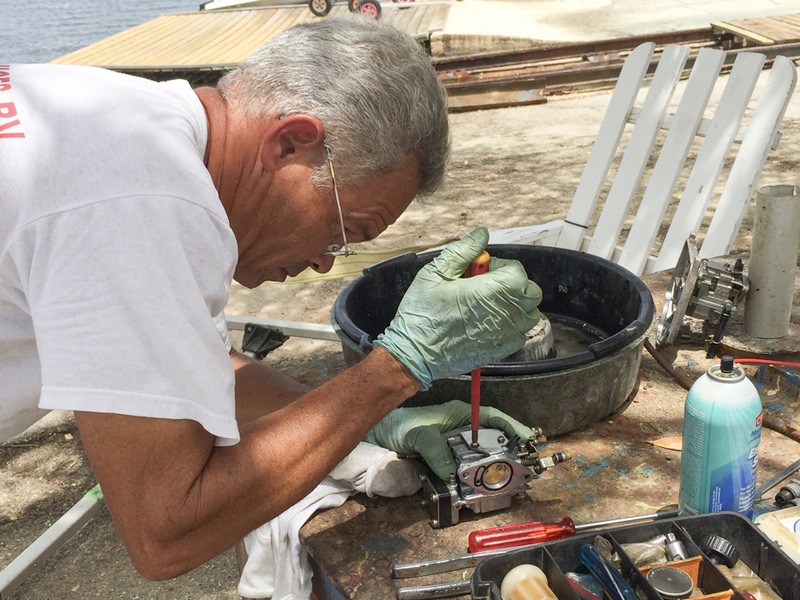 We got help from Curacao Marine to install two new 8D batteries for the bow thruster. We had the bottom painted with antifouling. I cleaned off the huge propellor and rudder, opting to leave it bare this time as an experiment, given that Prop Speed is expensive and keeps peeling off, and given that the Sergeant Majors in Bonaire do a creditable job of keeping the hull and running gear remarkably clean. This entry was posted in Curacao and tagged Curaçao Marine, Punda, Rodeo Restaurant, Willemstad on January 12, 2018 by admin. When the 7-yr old 25 hp Yamaha outboard developed problems — it would not stay in reverse — we investigated and found worn gears and worn linkage. Unfortunately, we could not find a replacement motor with electric start. Barb was especially concerned. In the end, we decided to purchase a new 30 hp Yamaha motor, manual start notwithstanding. All of the exercise at the gym is paying off: Barb can indeed start the beast. Fortunately, the Yamaha dealer was willing to serve as a broker for the old motor and we got a good price when it sold “as is” almost immediately. 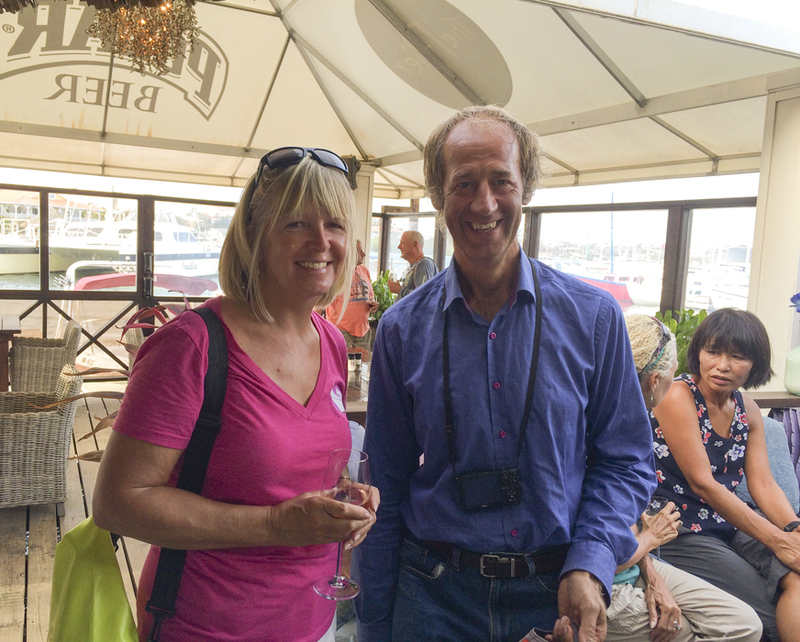 We did a fair amount of socializing with a local resident of Dutch descent: Paulien Wijnvoord. She is keeping our pickup on her property while we are gone. Why are we hiking at noon? 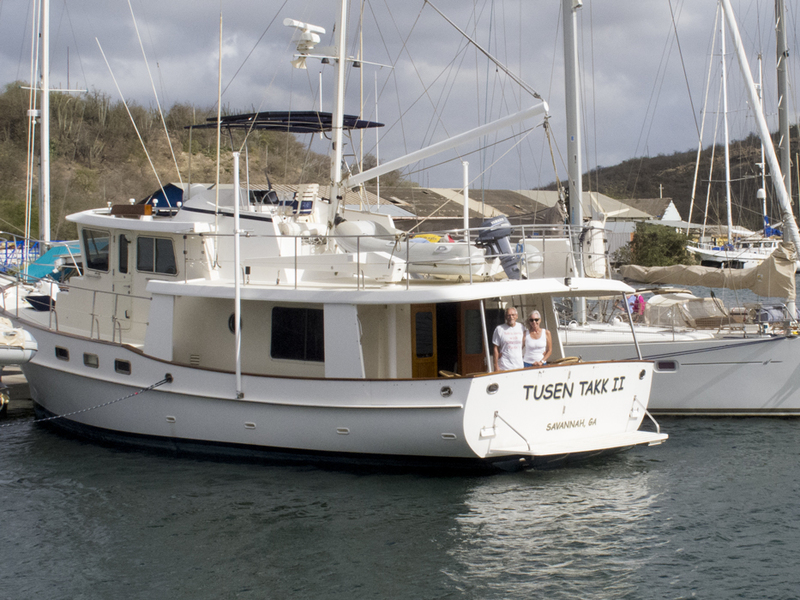 Tusen Takk II and Dolce Vita made the 50-mile passage from Bonaire to Curaçao on April 25. (Celilo had crossed about a month earlier in order to be free to accept an invitation to crew on a vessel that was going to visit Cuba.) Long time readers will remember that we leave the boat in Curaçao because there is not suitable facility in Bonaire. When wind and sea conditions resulted in Dolce Vita not being able to keep up with TT2 on sails alone, she switched to motor sailing. Alas, after a time she developed fuel problems: clogged filters due to dirty fuel. A change of filters did not suffice to clear the problem. This was worrisome, because the final leg of the trip to Curaçao Marine past the Queen Emma swing bridge and then down the relatively narrow channel through Willemstad could not be done under sail. We slowed down to stay with them, and readied lines in case we would have to tow them to the Marina. Colleen sailed while Bill spent most of the trip trying to combat the problem; there was so much “snot” in the fuel that the lines clogged as well as the filters. He ultimately resorted to disassembling the filter assembly and to using compressed air to clear the lines. Shortly before we neared the opening Colleen announced on the VHF that the engine was running again. We sent DV in first, and we all held our breath as we made our way to the Marina. They just made it! How do we know it was “just”? Because the engine wouldn’t start some days later when it came time to move from slip to haul-out dock. Tusen Takkk II also had issues on the trip from Bonaire to Curacao. Several hours into the trip we noticed that the engine temperature as indicated on the pilothouse gauge was running a bit high. We went down into the engine room and took direct readings near the temp sender with an infrared gun thermometer. The readings looked fine. So the question became: was the method of measuring internal temp with the infrared gun flawed, or was the pilothouse gauge wrong. We consulted with Bill via VHF and he urged that we test the system by increasing our RPMs to see if the temps would continue to rise, and if so, would they level off at some point. So we kicked the RPMs way up, and watched the two conflicting indicators as they both rose. We stopped the experiment when we got a “high temp” warning alarm on the console at a temp that would presumably be OK but high on the infrared gun. Lower RPMs brought the temps down to “just slightly” high, and we continued the rest of the way without incident. After we got on the hard I removed the heat exchanger and found that it was indeed partially blocked. Conveniently, MRC, which has a shop adjacent to the Curacao Marine offices, was able to flush the exchanger with muriatic acid and render it squeaky clean. I reinstalled the exchanger before we left Curacao, but will have to wait until we splash again next Fall to see if that has completely resolved the problem. On April 27 we suspended our chores early and drove downtown to join the throngs celebrating Koningsdag or King’s Day, a national holiday in the Kingdom of the Netherlands. The date marks the birth of King Willem-Alexander. Up until 2013, when Queen Beatrix abdicated and was succeeded by her son Willem-Alexander, the holiday was known as Koninginnedag or Queen’s Day and was celebrated on 30 April. On April 29 we took another break and visited the Museum Kurá Hulanda – the museum with the largest African collection in the Caribbean. Opened in April 1999, the museum is the vision of Jacob Gelt Dekker who founded and privately funds (initial investment $6 million) it through the Jade foundation. Museum Kurá Hulanda is an anthropological museum that focuses on the predominant cultures of Curacao. It offers a world-class chronicle of the Origin of Man, the African slave trade, West African Empires, Pre-Colombian gold, Mesopotamian relics and Antillean art. For a number of years we have been using, with only limited success, PropSpeed to protect our rudder and propellor from fouling. But it is quite expensive, and so last fall we decided to try priming and then applying bottom paint. See below for some impressive modern art. We flew to Savannah on April 5. I guess there was a lot of moisture in the air. See below. This entry was posted in Bonaire, Curacao and tagged Curaçao Marine, Koningsdag or King's Day, Kura Hulanda Museum, Punda, Queen Emma Bridge, Queen Juliana Bridge, Sint Anna Bay, Willemstad on May 22, 2017 by admin. We arrived at Curacao Marine late on November 1. Very late. Last flight in and after midnight before our taxi dropped us off. Next morning, we woke to a very dirty boat. For the next 7 days we would frantically hustle to get the boat ready for our trip back to Bonaire, where we would rejoin our friends Michael & Roberta (Celilo) and Bill & Colleen (Dolce Vita). We commissioned to have the boat thoroughly washed and then waxed and polished (the “white” parts) and painted with anti-fouling (the “blue” parts). Bill had left behind his grinder so that I could strip the rudder and propeller, preparing for an experimental covering of primer and bottom paint (instead of the usual Prop Speed, which hasn’t been working very well.) And I had the unfinished business of installing new oil seals in the dinghy outdrive. We set a record with our shortest re-commission ever. Pierre threw one of his periodic barbeques on the 4th, I installed the oil seals on the 5th, we splashed on the 7th, we checked out on the 8th (and noted that the pontoon bridge was being festooned with Christmas lights.) 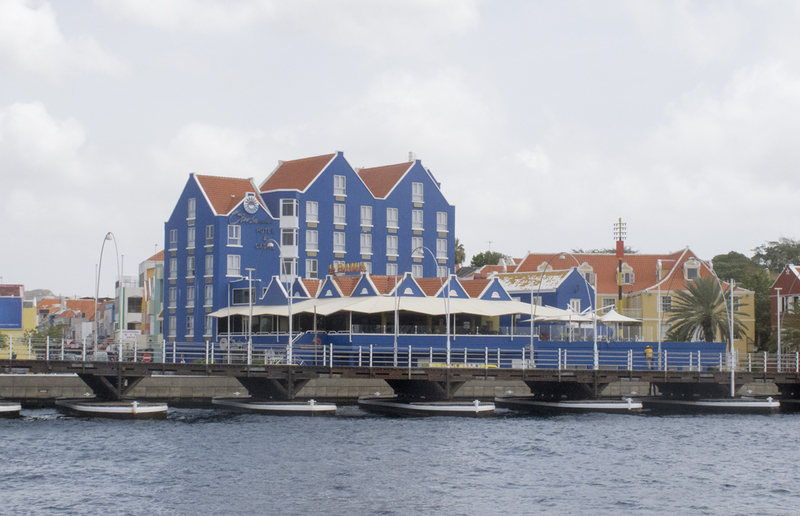 On our way out of Curacao on the 9th, Barb took some nice pictures of Willemstad and the pontoon bridge. And now out to open sea! This entry was posted in Curacao on December 23, 2016 by admin. We arrived back in Curacao on November 9, after a three-hop trip that took us from Atlanta to New York to Miami to Curacao. We lived on the boat on the hard until November 24, during which time the boat was washed and waxed, the bottom was painted with anti-fouling, and the prop and rudder were cleaned and then painted with PropSpeed. We were on the hard longer than expected because of the delay in the delivery of our bottom paint. We use a brand that is not popular down here, and so had to order it through Marine Warehouse for deliver just before we returned to Cuarcao. They had the paint delivered to the shipping company on time but forgot to give the official approval for the shipping. Fortunately, before we departed the US we checked to ensure it had been delivered to Curacao , and learned of the problem from the shipping company. They were able to get the paint on their ship the next day, but it still was two weeks before we actually saw the paint. So we spent an extra week climbing a ten foot tall ladder to get on and off the boat many times a day. Curacao Marine did a great job getting us back in the water as quickly as possible. We socialized with “Changes” and “More Mischief”, and later with Bill (“Dolce Vita”) and his friend Bruce, who accompanied him to get the boat ready while Colleen stayed back in the States spending time with Bruce’s wife. Bruce helped me with installing new gaskets/o-rings in the dinghy carburetor, and Bill & Bruce both helped us install our new 32” flat screen TV in the saloon. (We gave the old 20” one away.) We stayed at the marina dock until December 7, during which time I put down two maintenance coats of varnish on the cap rails and ascended the mast to replace the sticky wind meter. While still at Curacao Marine we walked a number of times down to Willemstad, where we saw the finale of Hunger Games and had some lunches and shopped multiple times at the extensive and picturesque Venezuelan fruit and vegetable market. When at last we were in Spanish Water, we went for a number of 10K-step walks. (Guess who has become Fit-bit obsessed.) Near a huge abandoned “mansion”, we asked a young man doing some painting about the origin of the building, and he said that it was the home of a “boss” slave owner in former times. Later research on the web revealed that the building was constructed in 1883, well after the abolition of slavery in Curacao. In fact the building is known as the Quarantine Building, and was used to house arriving sailors for an interval to see if they had yellow fever. The young man also said that a clutch of nearby roofless rooms was former slave quarters, but we have become somewhat skeptical of that description. When Bill & Bruce had their boat ready, they left for Bonaire. But Bruce was scheduled to ultimately fly back to the States from Curacao, and so would need to take Insel Air from Bonaire to Curacao. Likewise, Colleen was scheduled to fly in to Curacao from the States and then catch the Insel Air puddle jumper over to Bonaire. So we picked Bruce up at the airport the day before his flight to the States, and he stayed overnight on Tusen Takk II. As an (unnecessary) gesture of thanks, he took us out to dinner at the Renaissance Restaurant in Otrobanda. We took Bruce back to the airport the next day, and waited for Colleen to arrive, since she was bringing us parts and supplies from the States. Her flight was delayed, and for a time it looked like she would miss her flight to Bonaire. So Bill, attempting to be helpful, made a phone call and changed her ticket to a next-day flight, and we would have another overnight guest. In the end, Colleen was able to change the tickets yet again and catch a later flight that night, so we left the airport without her after sharing a pizza “supper”. Later we learned that her flight to Bonaire was delayed three hours so she didn’t get there until after midnight. We look forward to joining them in Bonaire soon. We are able to spend six months in Bonaire a year and then have to be away for six months. Since we left Bonaire on June 15th, our target date to return is December 15th. This entry was posted in Curacao on December 12, 2015 by admin. Our trip from Bonaire to Curacao was uneventful. We staged originally in Spanish Water, where we were reunited with cruising friends who had proceeded us in the move. I used our time there to add several more coats of varnish to the cap rails, knowing that TT2 would be sitting out in the hot harsh sun while we were gone for the summer. When we moved to Curacao Marina, we had a number of pleasant sun-downers with the folks there. We all also hiked up to Rodeo Restaurant for steak dinners. 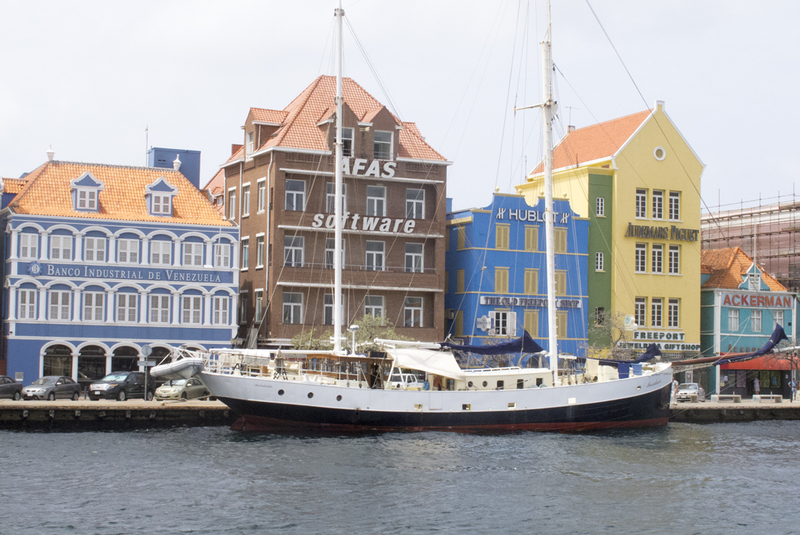 We look forward to exploring Curacao more extensively when we return in the Fall. This entry was posted in Curacao on July 28, 2015 by admin.